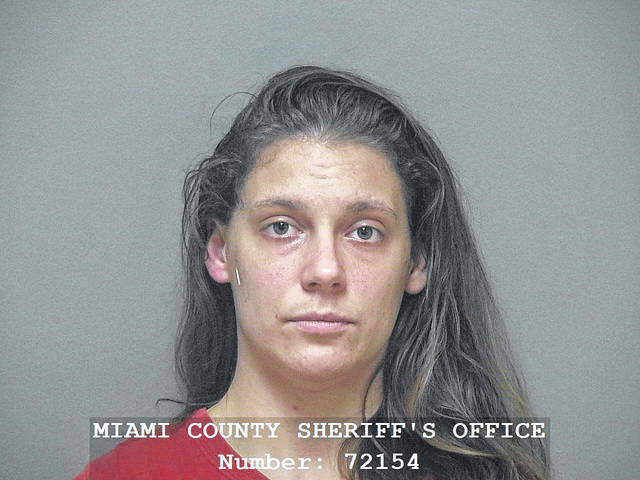 MIAMI COUNTY — A local woman who reportedly assaulted a police officer and then was subsequently tased by police in Piqua on Thursday afternoon was arraigned in Miami County Municipal Court on Friday morning. Casey S. Runkle, 27, of Piqua, was arraigned on two counts of fourth-degree felony assault, one count of first-degree misdemeanor child endangering, one count of first-degree misdemeanor interference with custody, and one count of first-degree misdemeanor resisting arrest. The incident stemmed from a custody issue at approximately 3:15 p.m. on Thursday in the area of Water and Walker streets in Piqua, according to court records. The Miami County Children’s Services Board asked for police assistance while they took custody of a child. Runkle refused to let a 2-year-old child go, during which she allegedly kicked an officer multiple times and caused him to fall backward onto the sidewalk and sustain injuries at one point. She also reportedly attempted to kick another officer in the face while resisting arrest. This struggle occurred while another officer was attempting a bear hug on Runkle, trying to get her separated from the child, according to court records. Another officer eventually deployed his taser on Runkle, which was effective and allowed for officers to take hold of the child. A medic from the Piqua Fire Department responded to the scene. She refused treatment afterwards and was incarcerated in the Miami County Jail. Runkle is continuing to be held in the Miami County Jail on a total bond of $8,500. A pretrial conference for Runkle is scheduled for Feb. 13. Runkle was previously charged with another count of child endangering in late November. An anonymous caller stated a woman was living in a home without any electricity with several small children on Nov. 26, at approximately 8 p.m. The caller stated they were concerned for the children’s well-being, considering the freezing temperatures. Police made contact with the woman. Living arrangements were made for the night. The Miami County Children Services Board was contacted. Runkle was was charged with first-degree misdemeanor child endangering in connection with this incident. That case is still open in Miami County Municipal Court. A court trial is currently scheduled for Runkle for Feb. 13. • Kathleen R. Adams, 43, of Dayton, received a $25 fine and 30 days of suspended jail time for fourth-degree misdemeanor unauthorized use of property, amended down from first-degree misdemeanor theft. • Anson M. Block, 38, of Troy, received one year of probation, a $100 fine, and 90 days of suspended jail time for second-degree misdemeanor criminal damaging. • William Farmer, 28, of Troy, received a $100 fine and 30 days of suspended jail time for fourth-degree misdemeanor disorderly conduct, amended down from second-degree misdemeanor criminal damaging. • Marcie A. Gregory, 38, of Tipp City, received a $25 fine and 90 days of suspended jail time for first-degree misdemeanor theft, amended down from fifth-degree felony theft. • Shelia A. Harvey, 45, of Troy, received a $250 and 60 days of suspended jail time for second-degree misdemeanor biting animal to be confined. An additional four counts of second-degree misdemeanor biting animal to be confined were dismissed. • David W. Jergens, 38, of West Milton, received a $50 fine and 30 days of suspended jail time for fourth-degree misdemeanor criminal trespass and fourth-degree misdemeanor disorderly conduct. • Kyla M. Ward, 22, of Piqua, received one year of probation, a $100 fine, and 180 days of suspended jail time for first-degree misdemeanor possession of drugs, amended down from fifth-degree felony drugs.